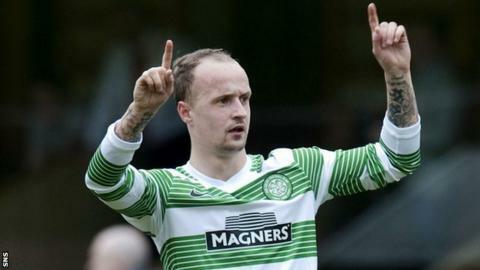 The Scottish FA will look into further claims in a Sunday newspaper of derogatory singing by Celtic and Scotland striker Leigh Griffiths. A notice of complaint was issued last week after video emerged of the 23-year-old chanting about the possible liquidation of Hearts. Now he is being accused of joining Hibernian fans in a song calling former Hearts player Rudi Skacel "a refugee". It is understood the SFA will consider it as part of the original charge. A Police Scotland spokeswoman told BBC Scotland it would also be launching an investigation, while Celtic are believed to have launched their own probe. Griffiths has already been disciplined internally by Celtic, but the Scottish champions have not yet commented about the latest footage, which was shot on a mobile telephone in an Edinburgh pub before last week's city derby. However, the player apologised to Hearts last week and manager Neil Lennon has warned him about his future conduct. Celtic had said they thought there was no need for any further action and vowed to defend the player, who was dropped to the bench for Saturday's 2-0 win over Dundee United but came on as a substitute. However, it is expected that Griffiths will escape with a censure from the national governing body following its own disciplinary process. In January 2012, a Dunfermline Athletic fan was fined £200 but escaped a football banning order after singing the same song during a match at East End Park against Hearts the previous October. The fan pleaded guilty to racially aggravated breach of the peace for the chant aimed at the former Czech Republic international. Former Scotland striker Derek Riordan, then playing for Hibs, also issued a public apology in November 2005 after being caught on camera singing the song about Skacel. Lennon said in October 2012 that any form of racist behaviour is "an instant sackable offence" at his club. Following the release of the original footage featuring Hibs fan Griffiths, the Celtic manager said: "I wasn't over enamoured with it. "We have dealt with it as a club and we have told him there is a certain code of conduct he has to adhere to when he is here at Celtic. "He didn't use bad language or act in an aggressive manner, but it hasn't pleased me. "I can understand why the SFA have become involved - they have guidelines - and I can understand people who probably rung the SFA to complain about it as well. "There will be people on the Hearts side who will think it is insulting and derogatory. "From my point of view, he probably shouldn't have put himself in that position in the first place. But, from the other point of view, is it the worst thing in the world that he has done? No. "I don't mind him supporting Hibs, Hearts or Tottenham Hotspur, whoever, but in public places he has to behave accordingly at times. "He is a Celtic player now and his whole focus should be on Celtic."